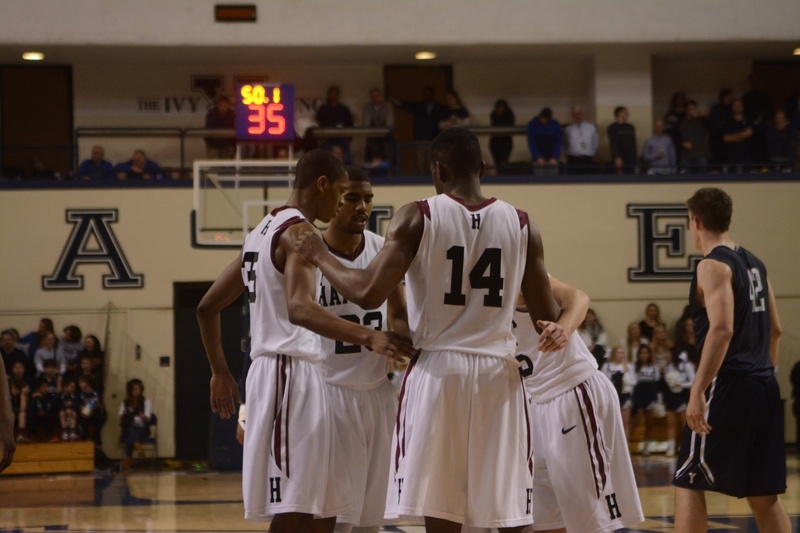 Harvard and Yale will meet Saturday at 4 p.m. with a trip to the NCAA tournament on the line. This Harvard men’s basketball season has had more downs than ups. That’s the downside of past success and high expectations. 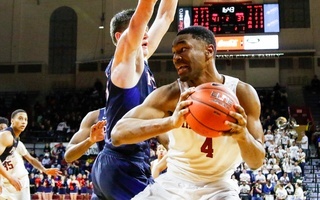 So it was only fitting that the Crimson’s biggest high came not during a game but 62 minutes after one, while the team’s seniors ate pizza and a few other players lingered in Lavietes Pavilion, glued to iPhones and laptops, hoping against hope for something else to break their way. Those hopes cashed in when Dartmouth beat Yale with a buzzer-beater to force an Ivy League playoff between the Bulldogs and the Crimson this Saturday with a trip to the NCAA Tournament on the line. In doing so, the Big Green ensured that this Harvard season will not be forgotten, regardless of what happens at the Palestra Saturday afternoon. Until that moment Saturday night, it seemed that coach Tommy Amaker and his Crimson program had finally run out of firsts, had finally stopped growing, had started dying. The last four years have been magical. There was the first Ivy title, the first tournament appearance, the first tournament win, and last year, the moment of glory when Harvard took the lead against powerhouse Michigan State, seemingly on its way to the first Sweet Sixteen in program history. This year, Harvard has missed nearly every chance it has had to make this season memorable. It lost its marquee nonconference matchup against Virginia—badly. It lost its Ivy League lead at Cornell and then lost control of its own destiny against Yale Friday. But then it got another chance. Without that Dartmouth bucket, this season would have been forgettable. Now it’s the year of the pizza party and the season of the biggest Harvard-Yale basketball game in maybe ever. And it has a chance to be even more. People like to brag about America as full of second chances. But it’s not really. Do-overs and re-dos are scarce outside of video games. Usually, you have to insert another quarter for another life or put down 20 dollars more to see another hand. Harvard doesn’t. That said, while this feels like a second chance for the Crimson, it might not be a real one. It just so happened that Yale’s third Ivy loss came after Harvard’s. If you put blue sunglasses on for a second, it actually starts looking like this is a second chance for the Elis. Yale was seconds away from its first Tournament trip in over 50 years. The Bulldogs were getting buzz going into the weekend in national media outlets. With a Rhodes Scholar on the roster and a respected coach who has never gone Dancing with a capital D, they were sure to become a fan favorite against whoever they might have faced in the first round. To get there, Yale just had to hold a five-point lead for 30 seconds. It didn’t. But that’s ok. Because these Bulldogs have two lives. And now they get a chance to beat Harvard again, to do it on a bigger stage, to write an even less likely Cinderella story. What matters is which team takes advantage of the chance, obviously. And that will come down to the coaches: Amaker on one side and Yale’s James Jones, the Coach of the Year, on the other. 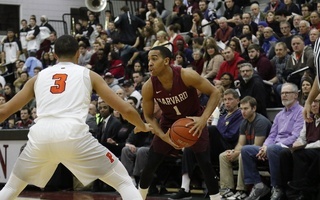 Both guys have been in Ivy playoff games, Amaker four years ago against Princeton and Jones over a decade ago in 2002. Both lost. Amaker won outright the next year, Jones did not return. Amaker, as he explained to the media Wednesday, has told his team to celebrate being Ivy champions. The accomplishment is not a fluke, even if that final play of the Big Green win feels like one. When he watches film, Amaker is looking for quality rather than results, and the same is true when asked to analyze the regular season. Fortune played a role, he said, but listening to him talk, it does not sound like he thinks Harvard was lucky, per se. I don’t know how Jones will spin the situation to his players, or how either coach’s choice will go over with their team. We’ll have to wait until Saturday to find out. And when we do find out, it will be unforgettable.